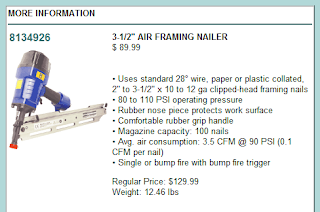 While I an very happy with every other tool I have so far purchased at Princess Auto, I am not very happy with my purchase of the 3.5 inch framing nailer, or shall I say the two have purchased. I purchased the first one well over a year ago on sale at Princess Auto in anticipation for the cottage construction project this year. That one lasted two weeks or shall I say it lasted 4 days - two days on two consecutive weekends. First, while it punched in the 3.5 inch nails quite nicely, it simply would not take the smaller 2.5 inch nails with out jamming. Furthermore, the nailer slowly self-destructed as the plastic guides shattered and fell out of the nail guide - fortunately even without the guides the nailer kept functioning. Finally it gave up the ghost and blew a seal. Fortunately one of my sons had not yet began his trip up to the cottage for the weekend. (ASIDE: I have taken of Fridays from work to go up early to prepare and start work, while he follows up on Friday evening after work) A quick call on the cell phone and he made a swing by Princess Auto to pick up a new nailer. In spite of the one shot nature the nailer works and we continue with it. The Princess Auto railers are roughly one-third to one quarter the price of the professional models. I have purchased two so not much savings - lots of frustration. Next time i will go professional and pay the bucks!